The villa is furnished to a very high standard both inside and out. The beautiful open plan kitchen diner is very high spec including a Dolce Gusto coffee maker and with all the utensils you will need plus there is also a large wine/drinks chiller. There is also a large living room with flat screen TV, DVD player and various Bluetooth music systems dotted around the villa. Air conditioning is fitted throughout the villa as well as wifi. There is downstairs bedroom with double bed, en suite bathroom with shower room and there is a door from the bedroom which opens out onto the pool. Upstairs you will find two large bedrooms. Both bedrooms have king size beds bed, large en suite bathrooms with shower room and both have sun terraces. 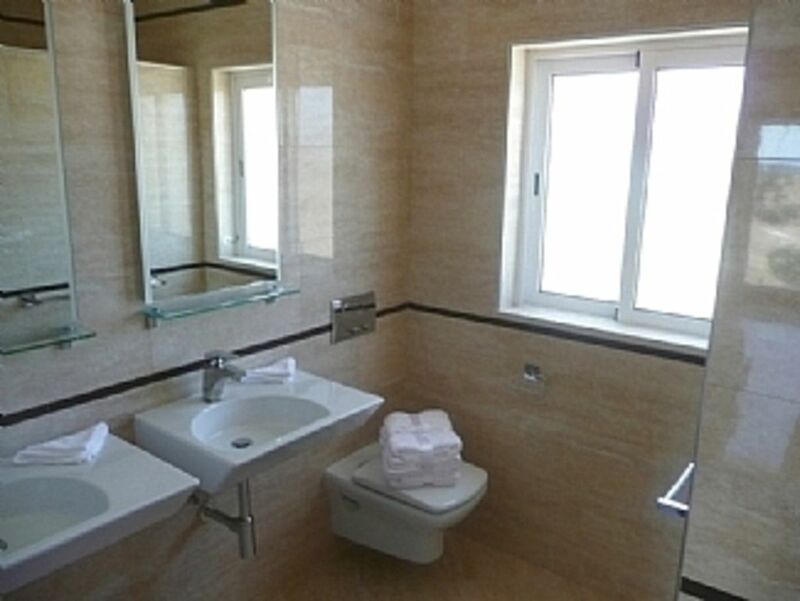 There is an additional bathroom downstairs with a large bath. At a small extra charge we can accommodate an additional two people as we do have fold out beds which are available on request. Outside you can find a stunning garden area. There is a large patio area with sun loungers, barbeque, large pagola seating area plus outdoor eating area. There is a large outdoor swimming pool which also lights up at night for a wonderful relaxing night’s swim. The villa is wheel chair friendly with a downstairs bedroom and bathroom also the garden area is level. Children are also welcome but we do advise they are supervised at all times due to the outdoor pool. We are situated fifty minutes drive from Faro International Airport. The local villa of Vila Nova De Cacela is about five to ten minutes drive away in which you can find all the local amenities including supermarket, cash machine, pharmacy, coffee shops and a wonderful bakery. The historic Roman town of Tavira is about a 20 minute drive away. Tavira is an old Portugese fishing town in which there are many shops, restaurants and bars but Tavira keeps its unique traditions and handsome character. Tavira is a great place to visit during the day but by night it also has a friendly calm night life. Cacela Vella is also quite close, situated on top of a hill it has stunning views to the eastern most lagoon of the Rea Formosa river. Cacela Vella also has a historic church plus some quaint charming and sweet coffee shops. We are located ten minutes drive from Praiar Verde beach, Manta Rota beach as well as Altura beach. The beaches in the area are extremely family friendly. Located quite close to us is the world famous Fernandes Restaurant where you can sample traditional Portuguese cuisine at local prices, this is the restaurant that the local Portuguese people go to. There are a few golf courses in the local area including Monta Rei Golf and Country Club and Quinta Da Ria Golf Course which is about twenty minutes drive away. All in all your stay at Villa Flora Antonio will be magical and a holiday that will stay in your hearts and minds as a holiday you truly adored. There are four bathrooms. Two large bathrooms upstairs with twin sinks and walk in showers. There is a large family bathroom downstairs with a bath and twin sinks. Also there is another ensuite bathroom downstair with walk in shower. Large lounge, with stylish staircase, three sofas for ample seating. LCD TV, DVD, music stereo. This room has three sets of patio doors giving fantastic views. There is a well equipped kitchen with hob, oven dishwasher, large fridge, large wine chiller, freezer, microwave, and anything you might need. There is a large dining table for eight. The doors from the kitchen open onto the dining area on the terrace. There are five golf courses within a short drive. The famous and very impressive Monte Rei, Jack Nicklaus golf course, is only a few min away. It is well worth a visit to have a drink and a look around, even if you don't play golf! Notes on accommodation: Cot and high chair available on request. Outside: Outside there is a large pool, with large terrace area. There is a bbq area and a very nice dining table outside to enjoy the Portuguese way of life. The pool and gardens are well maintained at all times. There is plenty of outdoor quality furniture. Utility Room: Washing machine, ironing board, iron. Cleaning / Towels / Linen / Maid service: Weekly cleaning and linen change, additional cleaning available at extra cost. We loved our stay in this beautiful villa. Sam looked after us beautifully. The location and setting were perfect and such a treat to have a villa in Portugal with decent outside shade. It worked perfectly for 4 adults and 4 children. We had a very happy time for our annual trip to the Easter Algarve and hope to return again next year. The villa is perfect - spacious and well equipped, with plenty of outdoor space and a great pool. The location was perfect for us - quiet, but within easy reach of local restaurants, shops and beaches. Booking was easy and keeping in touch with Sam was great - all-in-all, it was perfect for our relaxing holiday! Stayed here for 2 weeks in July, the villa is amazing. Kids loved the pool which was quite warm despite it not being heated. The villa is massive and has everything you could want to make a really special holiday. There are some lovely beaches nearby and we ate out in Tavira plenty of times, such a pretty little town. Sam was first class in her communication and could not have been more help. I wouldn't hesitate to recommend this place and hope to go back in the future. The villa was amazing. It had everything we needed for a fantastic relaxing holiday. The villa was fantastic. Very spacious which meant we all had our own space. The pool was great and was well used. The bbq was well used and allowed us to eat alfresco and make use of the great outdoor space. We had a brilliant holiday and would highly recommend the villa to anyone - as long as you dont mind having to drive as a car is essential. We loved it. We have just arrived home after an amazing holiday in Villa Flora Antonio, Vila Nova de Cacela. Eastern Algarve. The villa is located high on a hill set way back from the road with far reaching views over the stunning countryside. It is so peaceful! This spacious luxurious villa is both light and beautifully decorated. There was more than enough space for the eight of us. We love to BBQ and found that there was everything we could possibly need to serve up a magnificent feast. It has a full height drinks fridge, fridge and 1/2 size freezer, a large oven and 5 ring gas hob. There are TV's everywhere and music stations. The beautiful large en-suite bedrooms are air-conditioned and have enough wardrobe space for a six month holiday! Outside is a beautiful spacious entertaining area with a sun-terrace that wraps around the large swimming pool, a huge pagoda with a large outside lounge area for those who want to escape the sun or sit outside into the wee hours. Sun-beds for all and a further outdoor dining area and large brick built BBQ. We had so much fun playing in the pool with the water guns and lazing around! Rua Jose Colaco Fernandes is a traditional rustic Portuguese restaurant which is approximately a 5 minute walk away. We ate delicious food there a few times and got to know the friendly staff. They were so accommodating and would cook off menu for the fussiest of eaters and even allowed us to use them like a shop when we ran out of some food supplies. I wouldn't hesitate to recommend this beautiful villa to anyone wanting a fabulous retreat to unwind. There is plenty to do further afield: beautiful beaches, and an abundance of restaurants a short drive away plus a couple of golf courses including the prestigious Monte Rei Golf Course which is a few minutes' away. We will be back! Very well equipped, spacious rooms, lovely pool. We were delighted with the villa which suited us, a group of six adults wanting to relax for a few days in a good quality villa in a quiet location. Everything we needed to make our stay enjoyable was provided and the owner Sam could not have been more helpful. Villa Flora Antonio is excellent value for money suitable as an adults get away or for a family. There are plenty of beaches to visit. The nearest is Manta rota, wich is about 6km away. The beach in Altura is great day out for any family, and a little further you have Monte Gordo beach. They all have plenty of bars, restaurants and parking. We highly recommend you hire a car when renting the villa. The local airport is Faro (it is around 40 min by car). The A22 motorway is around 4km from the villa. Bars, restaurants and supermarkets are within a 10 min drive. The nearest village is Casela, where you will find banks shops, markets, bars, restaurants, pharmacy etc. Nova Cacela is a wonderful quiet town with plenty to offer. Tavira is a great old town well worth a visit, there are plenty of great places to eat. There are water parks you can visit, around an hour's drive. If you want a late night out, you can visit Monte Gordo ... also there are many bars and a couple of night clubs on the 125 road. Cacela Vela has a charming old church, with fantastic sea views and very nice places to eat. There is plenty to do in the Eastern Algarve and the prices are very reasonable. Booking Notes: 30% Deposit upon booking. And the balance is due 8 weeks before arrival. A refundable deposit is requested on arrival. Guests will be met at the property and given the keys. Changeover Day: Flexible. but usually saturday - saturday in the summer holidays . Notes on prices: Prices are shown in euros. Price includes weekly cleaning and change of linen/towels. Extra cleaning available on request at an extra cost. Discount is available for long term rent. There may be a heating charge during the winter months.